Attention: iPads and tablets that do not run flash player, must download the FREE Puffin Academy app for schools to run the FF4Kids courseware. Want to start laying foundations for strong financial futures in your community? Kansas Council for Econ. Ed. The Kansas Council for Economic Education and its partners are proud to introduce Financial Foundations for Kansas Kids! 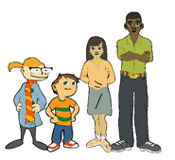 FF4Kids is a comprehensive set of standards-based, interactive computer courseware lessons that integrate personal financial literacy and its underlying economic principles into the social studies, language arts and math curriculums. The courseware contains a total of 28 hours of interactive learning for students in grades K-2, 3-5, and 6-8. Each of the 75 lessons provides approximately 20 - 50 minutes of instruction delivered by engaging age-appropriate characters, and over 350 interactive activities including 157 math exercises. All K-12 schools in Kansas can receive access to the courseware and teacher training free-of-charge! Complete the online tutorial to find out how to get access to this great resource! 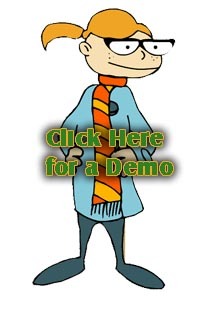 FF4Kids courseware is available online or on a CD that can be installed on your school server or computer. Click on the teacher tab above to receive your password for Internet access or complete the online tutorial to request a CD. *iPad and tablet users that do not run flash player must download the FREE Puffin Academy App to run this FF4Kids courseware. Once the app is downloaded, go to ff4kids.com and log in with your email and password to FF4Kids. If you would like to participate in a live training, please send your contact information to KCEE@wichita.edu and we will do our best to setup a date/time that will work for your schedule. If you are using FF4K in your classroom, please register for our mailing list so we can keep you up-to-date with FF4K news and other economic resources. What are teachers saying about FF4Kids?